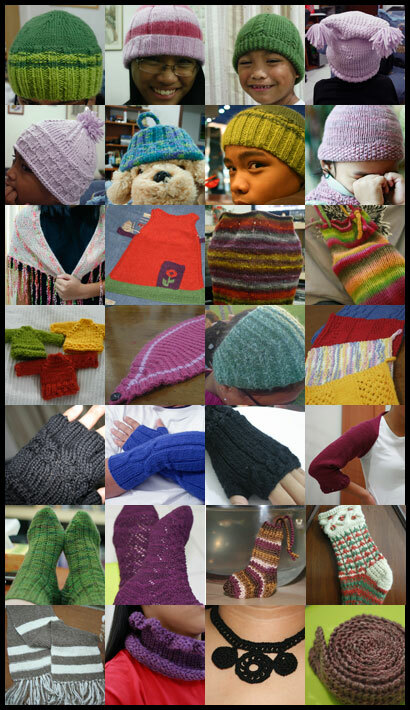 2008 was a great year for knitting for me. I learned much much more. I actually knitted and finished projects. There were hats, bags, wash cloths and (woot!) socks! Later I will post a photo of my favourite yarn stashes this year. What made me a Fearless Knitter in 2008? I think the fact that I invested into this craft is a big thing. But I think the most telling sign is the fact that I finally knitted and finished socks! But I am far from 100% fearless because I still have not conquered charts. Go on a yarn diet – seriously. I am in 6 yarn clubs which will keep me supplied with yummy colourways all year round on top of the stash I already have. Knit and finish a sweater for myself. The February Lady Sweater is the first one I will tackle. Knit and finish an Adamas Shawl. Knit and finish a pair of socks at least once a month. Knit Christmas gifts and start on them ASAP. Learn to read charts and knit from them without transcribing. Also organise my pattern folder into types of garment and also create a do-able knitting schedule. I feel so honoured to have met (online anyway), communicated with, exchanged tips with, knitted with and basically just be in the company of some of the most generous, talented and rockin’ bunch of knitters all over the world. Let’s keep on rockin’ in 2009.